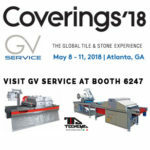 This year GV Service will exhibit Tecnema ECO LINE operating at our booth. 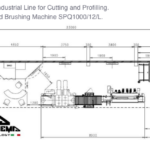 This is a Cutting and Profiling line for bullnose and 45° steps, consisting of Cutting Machine, Transfer Device, and Bullnose Machine. 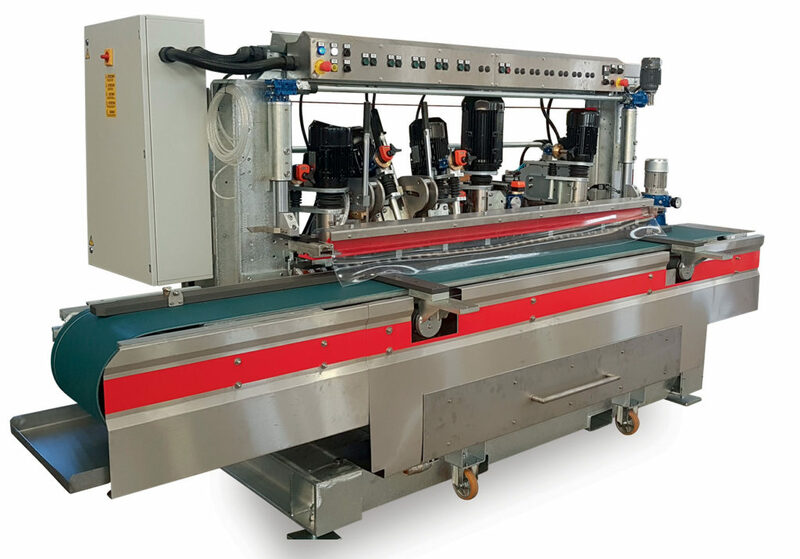 If you are interested in this complete production line, it is available for advance purchase. 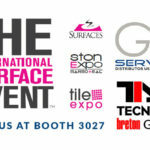 Shipping from the trade show site. Email us at sales@gvservice.com. The cutting machines mod. 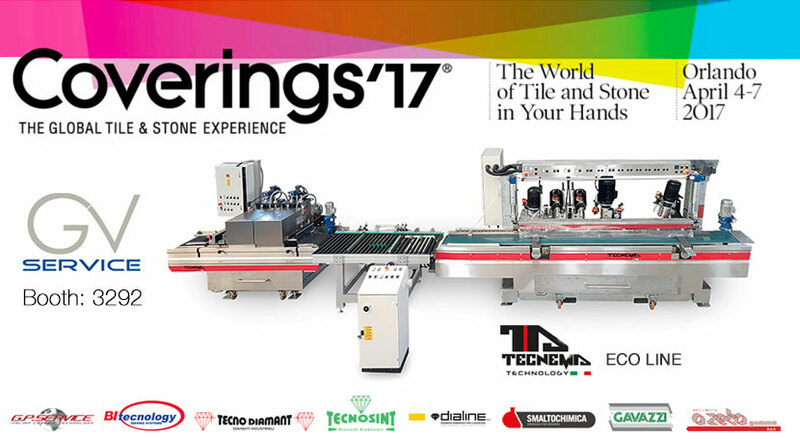 ECO LINE FS 400/N have been designed for continuous cutting of ceramic and stone materials. 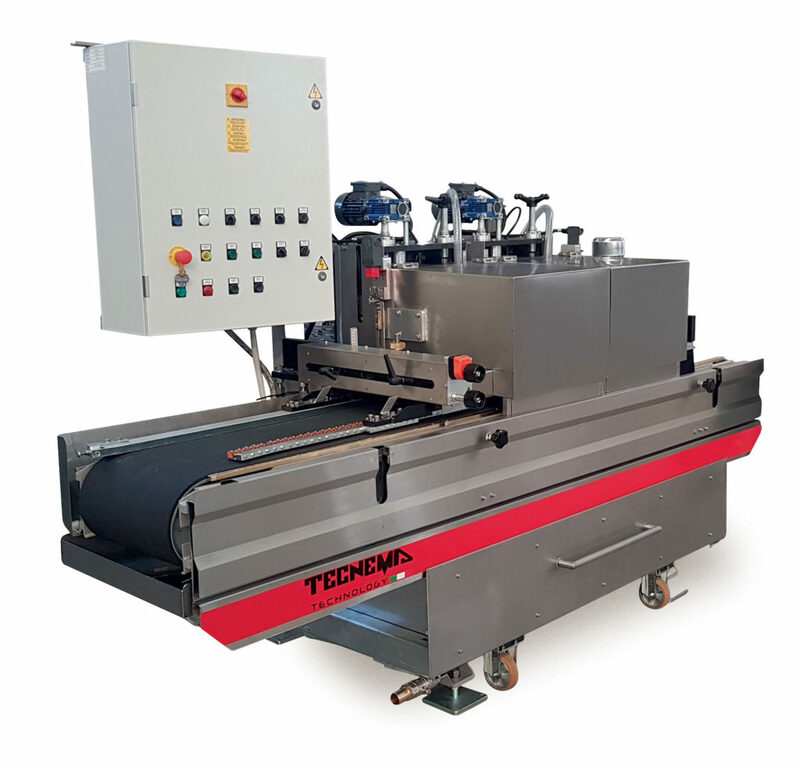 The saws are equipped with conveyor belts featuring variable speed drive motors. 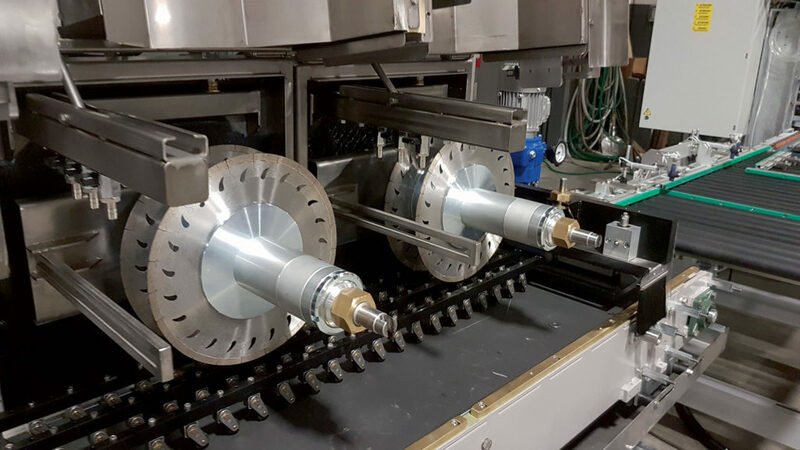 The cutting units can be adjusted vertically and transversally and allow the rapid set-up of diamond discs on stainless steel sleeves. The cooling of the cutting discs is performed through the PVC sprayer tube system (optional). Machine designed for obtaining half-bullnoses, round bullnoses and beveled edges, suitable for ceramics, porcelain stoneware, marble and granite of any size; ideal for producing skirting tiles, 45° steps, bullnose pieces, and bases. 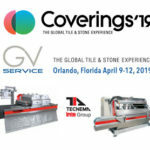 Recommended both for small as well as high production rates of porcelain stoneware, natural granite, single- ring and marble with matt or gloss finish of the profile. Spindles Constructed by Tecnema design: being our spindles designed and manufactured by us are practically eternal and if the customer has an issue, simply replace the motor. The spindle assembly will last over the years also ensuring a higher quality of work efficiency and reduced tool consumption. 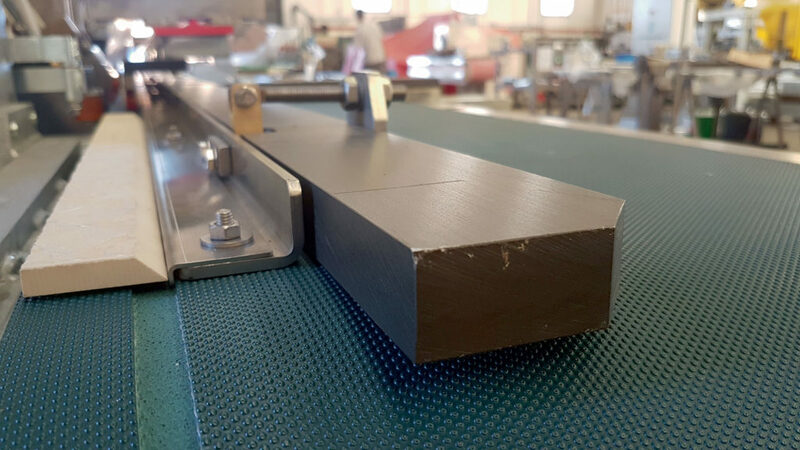 Since our machine has multiple tools via a multi-stage grinding process to achieve a bullnose edge, the 2 positions for “chamfering” will be angled at 30 and 60 degree, so the 3rd position doing the actual half bullnose edge will result in less stress on the motor and on the tool, allowing for higher quality and less stress on the tool means it will usually last longer. 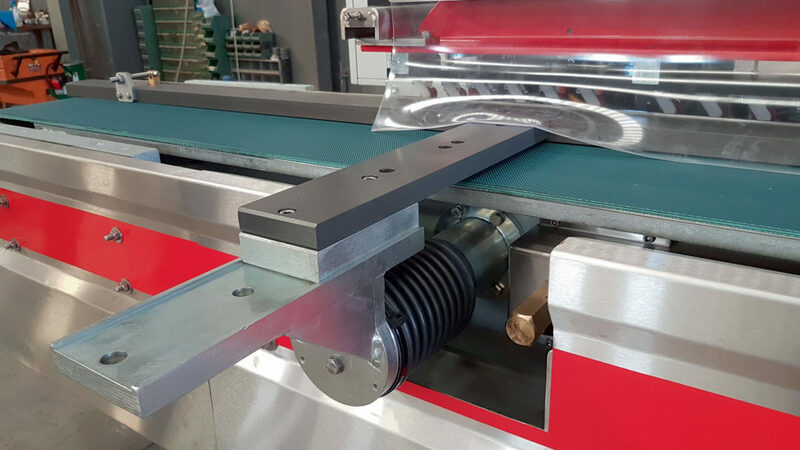 Possibility of production steps at 45 ° Thanks to our new system for easy adjustment of the spindles with our machine, we can produce the steps at 45 ° using the first 3 positions [brand- chamfer 1 and 2]. This means a new product for high- value customers (selling price much higher than the baseboard). Ease into the spindle control: thanks to our new support groups, the spindles can be adjusted easily in 10 seconds. Durability of the machine: + 2,000 Kg. Machine with consequent advantages in terms of the asset’s useful life (depreciation cost for the customer that needs to be spread over at least 15 years of useful life), and quality of workmanship. We offered a Tr. Roller + blowing group to separate the bullnose at the exit of the machine and prepare stacking on the last PVC conveyor belt. Stacking area belt conveyor collecting bullnose is simpler and more effective for the operator.